Network Analysis is a five-day workshop taught by Doug Steinley that focuses on the application and interpretation of techniques for modeling connections between observations (e.g., actors) within a network. Examples include social networks among peers, connectivity networks in fMRI data, symptom networks in diagnostic data, and management networks within the workplace. In this workshop we first introduce the basic concepts of network analysis, such as centrality measures, and the descriptive, structural analysis of network data. After covering these foundations, we discuss special considerations for two burgeoning areas of application: brain network analysis for examining connectivity and psychometric network models for examining the structure of item responses (e.g., symptom networks). Last, we explore how we can use exponential random graph models (ERGMs) to obtain inferential tests of specific hypotheses about network characteristics in both cross-sectional and longitudinal data. Throughout, we demonstrate visualization techniques for leveraging the true power of network data — understanding how observations are interrelated with each other. Our workshop is designed for graduate students, post-doctoral fellows, faculty, and research scientists from the behavioral, social, and health sciences. Software demonstrations will be provided in R (you can download R for free). While it is helpful to have some familiarity with R, this is not necessary. The lectures which constitute the majority of the workshop are software-independent. Our motivating goal is to provide an intense yet enjoyable instructional experience that focuses on a large number of both introductory and advanced topics in network analysis. We strive to strike an equal balance between core concepts of the analytic techniques along with their practical application and interpretation when implemented with real empirical data. 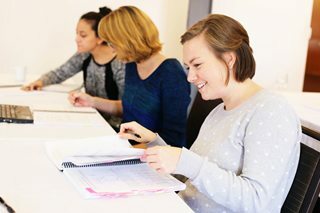 Our workshop is designed to provide participants with the materials and instruction needed to both develop a real understanding of network analysis techniques and to be able to thoughtfully apply these procedures to their own data. Presenter knowledge - Fantastic!!! Style of presentation - Fantastic!!! Extremely informative, useful, well-designed and well-structured. The speaker was fantastic. I would highly recommend this or other Curran-Bauer workshops. A big strength is the notes. These materials help me feel positive that I will be able to integrate these methods into my research. It's a very good introduction and detailed description of network analysis. Doug was great! Very engaging and clear lectures. Participants will receive approximately 35 hours of total lecture time as well as a bound copy of the course notes and the computer demonstrations. Although there is not a hands-on computer lab component to this workshop, Doug conducts extensive live demonstrations in R. R can be downloaded for free and class data, code, and documentation will be provided for all examples. Further, participants are welcome to bring personal laptop computers to follow along with the software demonstrations or to work on their own data applications. We begin each day at 9:00 and continue until 12:15 with a mid-morning break. Lunch is from 12:15 to 1:30 and attendees can select from a large number of restaurants in the downtown area. On Monday through Thursday, the afternoon session continues from 1:30 to 4:00 and includes a mid-afternoon break. Software demonstrations will be conducted from approximately 4:00 to 5:00 each day. On Friday, no software demonstrations will be conducted and the day will conclude at 3:30 to allow for afternoon travel. Finally, we will host a happy hour on Monday at 5:00 with appetizers and drinks. We have reserved a block of rooms in the Hampton Inn at a reduced rate that will be available until four weeks prior to the workshop or until the block is sold out. The hotel offers a wide range of amenities including workout facilities, a swimming pool, coin operated laundry, and much more. Rooms can be booked through online reservations or via phone at 919.969.6989 (refer to NET group code).